Heather Dessinger 40 Comments This post contains affiliate links. If you don’t love radishes . . . This recipe just might change your mind! Fermenting radishes takes some of the “bite” out of their flavor, replacing it with a slightly garlicky tang. 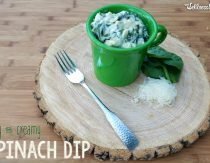 Both of my kids have been known to ask for second and third helpings when this dish makes it to our dinner table, so give it a try! Thoroughly wash and dry your jar and lid before getting started. Prepare your salt brine by mixing the salt and water together and stirring until dissolved. 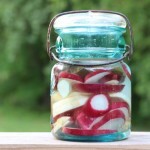 Pack radishes and garlic into your fermenting jar. Pour salt brine over the radishes until completely covered, leaving at least one inch of space between the top of the brine and the lid. 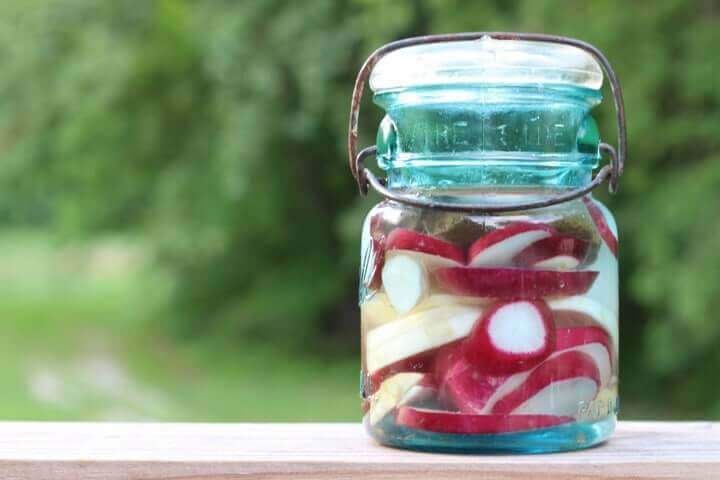 Place a weight inside the mouth of the jar to keep your radishes under the brine. Cover tightly and set up the air lock if you're using one. Drape jar with a towel and let radishes sit on your counter for 3-7 days, depending on how sour you like them. * When they've reached the level of sourness you like remove the weight from inside the jar and transfer to the fridge. * If you're using a jar without an airlock you will need to "burp" your jars periodically, otherwise carbon dioxide levels can build up within your jar and cause it to explode. Check the metal lid every day - if you can't push it down simply unscrew the lit a bit and then immediately tighten it back down. Using an airlock which allows the gases to release eliminates the need to burp your jars. We have been making these for several years just love them. My dad and my 2 year old son both gobble them up. One tip for anyone without a weight is to add sliced carrots as a thick top layer. They don’t float and will hold the radishes down. Thanks for sharing! 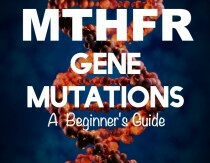 If someone is severely hypothyroid, how much radish should they consume/day? Hi Sabiha! Honestly, I don’t really know. In my research I discovered that black radishes contain more raphanin than red radishes but there was no info on how the Russians determined dosages. I’m guessing it varied quite a bit from case to case. Do Asian radishes – such as daikon or mooli – have the same compound? I love Gaktugi Kimchi! I am SO glad I saw this recipe today. I am making it ASAP! I would love to know if there are other recipes you can share that are beneficial to thyroid health. Thanks so much! Fabulous! The only fermented veggie I’ve done so far is sauerkraut and I love having it on hand. I’m sure I’d love these as well. Radishes are just one of those veggies that I can’t eat much of. If they’re fermented, I bet they’re much easier to stomach! I was so excited when I saw this thyroid healing recipe that I made it! Then I read this article http://www.thehealthyhomeeconomist.com/think-raw-veggies-are-best-think-again/ about how raw (even fermented) radishes (among other veggies) are actually harmful to the thyroids. There is so much conflicting info out there… just when I think I have something figured out it turns upside down. So, is it helpful or hurtful to the thyroids? Does anyone really know? Ahhh, it is confusing! I can’t claim to have the final answer on this, Emily, but I’ll tell you my experience. This year is the first time I’ve had access to a farmers market in the fall, so it’s the first year I had access to fresh radishes. I’ve never been a huge fan of them, but I found all of a sudden that I LOVED them! 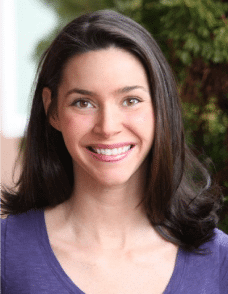 I am tall and thin, which for some reason tends to be a body type that leans toward hypothyroidism, so I was concerned about the effect on my thyroid for the reasons you mentioned. That’s when I started digging and found the info about how it is used in Russia. I’d run across it before but only in passing, but this time I researched as much as I could. It is definitely a practice that has been used for a long time there, so I think it’s likely there’s something to it. However, if someone finds that they have an aversion to them I recommend not eating them! Aversions in cases like this may be the body’s way of telling us that a particular food – though not inherently harmful – is harmful to us. Every situation is unique! A little late on this one but I had to get a good batch of radishes. Making this today and will be enjoying in a few days! Trying the carrot tip too to hold the radishes down. Thank you Mommypotamus! After the radishes have been transferred to the fridge how long do they stay good for? Hi Mindy! I’m not exactly sure. If the lid is tightly sealed they should last at least a few months. Could you just cover them with a clean towel and let the gases escape that way? Could you just cover the radishes with a clean dishtowel and let the gases escape that way? Thanks. no. you want to create an anaerobic environment. That means you don’t want oxygen in contact with the food. So you need a tight fitting lid. Preferably one that lets carbon dioxide escape. A cloth over the lid would allow way too much oxygen in and you will likely end up with spoilage. Hi Heather, I LOVE your site and visit it often. I was eyeing up my overgrown radishes today, which have got out of control over Christmas as we went away camping. I was going to pull them out because they will be all hot and pithy. Do you think they may still be usable for this recipe? Hi Pamela! I’m not sure, sorry! If you give it a try please let me know how it turns out! I made these radishes and I think they tase awful. How do I know if I made them correctly or if I just don’t like them? Thanks! My husband and I made these the other day! I can’t wait to try them. However, my husband seems to think they are pickled rather than fermented. Any thoughts/feedback? Finally made these and they are SO yummy! I’m going to have to make a few more jars. These won’t last long. Yay! So glad you like them, Natasha! Have you ever fermented radishes with Whey? If so, it there a difference in bacteria strains? I’ve only fermented with whey once and some things I liked and some I didn’t at all. Looking for super fantastic recipes using whey. Thanks in advance. the bacteria in whey is the same bacteria as in a finished fermented product. The whey speeds the process along, but is not necessary. I like to use whey because when the process happens more quickly, it reduces the likelihood of things going bad. Is it necessary to have an airtight seal while fermenting? I’ve seen some other recipes that just require a weight, but no cover or air tight seal to the jar. Just wondering if air would cause a problem to the fermentation process? Thanks for your help! Can’t wait to try these…. keeping the veggies completely submerged under a liquid, like the weight is doing, will create an anaerobic environment. 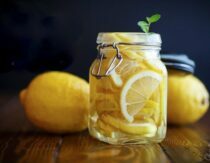 It’s risky to do it this way, as opposed to a tightly sealed jar, because if any oxygen gets in contact with the veggie, like if they start to float on top of the brine, then the whole batch can be ruined by mold. I’ve been fermenting quite a number of recipes over the years. However, I’ve not tried this one. Very tempted to try this as I find the radish/garlic combination interesting. Thank you for a nice site. Love your enthusiasm! I have two questions: instead of using a weight can I just add more water to the jar to cover the radishes? And, have you ever tried not using garlick , does it taste good as well? Hi, do you use hot or warm water? Thanks. These turned out great! I halved the ingredients for a smaller jar. We liked the flavor after 6 days. This was my first attempt at fermenting, and we are just thrilled with the results- Thank you! !